Anemones are striking wildflowers with lovely little details. Pretty papery petals surround intricate black button centers (except the green button center on the white on white variety). Twisty stems and “hairy” necks complete the wild yet wonderful Anemone. 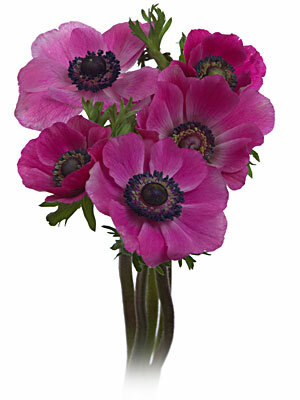 ORIGIN: The name anemone comes from the Greek word “windflower”. Thought to bring luck and protection, legend has it that when an anemone closes its petals, it indicates that rain may be approaching. Other myths assert that magical fairies slept under the petals when they closed at sunset. LASTING: At room temperature, anemones pop open quickly; expect up to 7 days of whimsical beauty.